I honestly dont want to be sentimental today, so I'll just write about the books I've just finished reading last week. 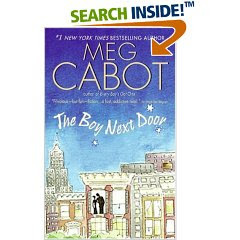 I've been hearing good raves about Meg Cabot. I cannot deny that her book Princess Diaries (which I've actually seen on movie) was a bomb, but only after reading her two books was I convinced that she deserves all the praises and raves about her works. The Boy Next Door is Max or should I say John? poses as Mel's neighbor's nephew who come rushing to New York to take care of "his" aunt's pets after the old woman was attacked by an unknown assailant. With all the dog walks, newspaper rivalries, and celebrity gossips and model's escapades, that guy next door and Mel fell inlove, but the question is who really is this guy next door? I love how the story was told and written through email conversations of characters, leaving you thrilled, and excited about the next scene, story and feelings each character is uncovering. The tardiness and unprofessionalism at work are delivered in a funny way, that instead of being mad and frustrated, you'll just end up laughing, and wonder how these characters get away with that? Then there's Boy Meets Girl which is a story of an HR Assistant, Lawyer and a sweet and kind Baker. Emails, journals, receipts, and restaurant menus.. where the story was told and written by each character. The story is funny and sweet in it's own little way, but I find it mature for a heroine to stand up for what she believes in. And you'll come across the The Guy's Next Door's characters in this book too. Meg Cabot is just brilliant, and funny, and witty! But now I am back with my dose of Shopaholic Series with Kinsella. I just got a copy of The Shopaholic and Baby. Just the right book treat for me today!